There are times when safe is dangerous. Above is my life's simple equation. I believe that in everything, it is impossible to let go of things that matter. While some people define love as the ability to let go of someone, I don't. The things or people we love will never cease being a part of us. If they do, then we don't love them (at all or anymore). The things (and/or people) we keep becomes a part of who we are and otherwise, parts of ourselves we lose. Once something is lost, there's no other way but to move forward. Just recently, I bought a bike. Just recently I lost my fear of riding bikes. Just recently I learned that there's no other way to maintain balance while moving... other than to pedal forward. Frankly, I didn't like the book. The story or rather the way it was told bored me. However, the underlying concepts between each chapter gave me many thoughts to ponder on--which became the redeeming factor of the book for me. Never Let Me Go is for the patient reader. I recommend it to book lovers who can tolerate a slow paced story/narration. I also recommend it to readers who enjoy books that ignite self-discovery. Fortunately, the book has been turned into a movie. I'd probably just watch it in reel, maybe I'd enjoy it more. Don't forget, the things you lose are always the things you let go of. Below is a video of Kazuo Ishiguro discussing his work. Please watch. 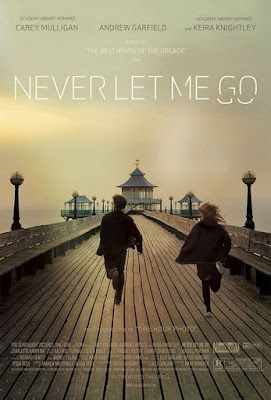 Please don't forget that Never Let Me Go has a movie adaptation released this year. Never Let Me Go (Php 599) is available at Fully Booked. For inquiries, visit their website here. LOTD #2 There's a new KID in town! Now I know why I MUST Learn how to drive. My Spanish Peel experience, first time! I want a White Christmas!!! How to achieve the perfect Christmas... Tips.